In my last post History, Politics, even Youth Work forgotten I close with a brief side-swipe at the contemporary misuse of the notion of ’empowerment’, whilst the press release for Doug Nicholls’ new book proclaims that Neo-liberalism silences the empowering voice of youth work. In this context it is illuminating to read Hannah Greenslade’s carefully argued critique of the way in which empowerment within our work comes to be individualised and stripped of its collective meaning. For me, empowerment is a process where a young person is able to gain an understanding of themselves as part of a wider group and the ability to begin to question and exert some control over their life, in the face of oppression…… It is certainly a political process, as it requires that person to question the society around them and make steps to change it. Unfortunately, this concept of empowerment with its roots in 1970s radical politics (Fitzsimons, Hope & Russell 2010), differs somewhat from how many would define the term today. The word ’empowerment’ can be found in the language of a wide range of social and healthcare professionals, is written into government policy and has even found its way into consumerist and managerial discourses (Quinn and Davis eds., 1999 cited in Fitzsimons, Hope & Russell 2010 ). 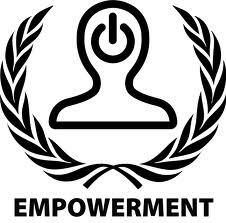 Far from encouraging young people to see themselves as part of an oppressed group or to be critical of their own position in society, the term ’empowerment’ refers increasingly to individualised notions of success; its enactment resulting in reproductions of existing power structures. The ideological weight given to individualism in consumer capitalism usually means that (…) the process of empowerment is viewed as working with people in order to increase their confidence, knowledge and skills. Often, perhaps because a ‘lack of power’ is commonly confused with a ‘lack of representation’, the empowerment of young people is measured in terms of their ‘participation’. Young people are increasingly given roles in forms of democratic or decision-making processes “as part of a discourse about modern citizenship” (Bessant, 2004, p. 387). This kind of involvement does very little for the empowerment of young people. Whilst there may be a feeling of a level of power and control for those individuals that put themselves forward for such positions (a large proportion of which are middle class [Smith, 1982, p41]), it does nothing to challenge the power of a small group to make decisions that affect others. Youth workers must be prepared to resist attempts by those in power to shape how young people themselves experience power. We must help young people take a step back and learn how they wish to go about empowering themselves. We must ensure that by ‘empowering’ young people, we are not simply handing them power with which to oppress someone else. Empowerment must come from those experiencing it and it must happen within a context that critiques the nature of power itself (Gomm 1993). It is crucial that we are explicitly political in everything that we do as workers. In the foreword to Freire’s Pedagogy of the Oppressed, Richard Shaull (1996) suggests that education cannot be neutral; it exists either to integrate the younger generation into the current system or as the “practice of freedom” (p16). If we do not act politically, we are merely reproducing the will of our employer or the state, thereby reproducing inequalities and oppression (Belton 2010, pxvi). In her conclusion she is perhaps overly optimistic about the extent to which youth workers are retaining control over their practice, but this is a key issue, which demands continued debate. Hannah’s paper is an excellent contribution to the ongoing argument. We are operating within the same system of power and oppression that has been discussed and should look to other youth workers to find ways to fight against youth work defined by political ideologies or funding streams. We should perhaps be pleased that youth work has not been professionalised to the same degree as, for example, social work, which many feel “is being undermined by managerialism and marketisation, by the stigmatisation of service users and by welfare cuts and restrictions” (Social Work Action Network, 2011); it seems that there is still a level of autonomy for youth workers and significant debate within the area. I would suggest then, that we must allow ourselves and encourage others to have political opinions on the social context in which we work, to see ourselves as activists and to challenge agendas which conflict with notions of empowerment wherever possible. It is only through this kind of action and attitude, that youth workers will be able to preserve the space which is needed to allow young people to work out who they are; to challenge the status quo and their own oppression. Back in the early 90’s I went for a few interviews for youth work post and questioned the use of “empowering young people” having been told I should always mention “how I would empower young people”. I think I upset a few people along the way saying we should encourage young people to have their own voice and say what they want and what they want to do. The voice and influence of young people is paramount. This should be a great read. Doug has been a tenacious and well-informed advocate for youthwork over several decades. I sometimes disagreed with him about tactics but never doubted his commitment to youth work’s core values and approaches.Now, when can we expect some of today’s principal national players in the sector to respond with their considered thoughts on the development of youth work ? An article in ‘Youth & Policy’ would be a start since it can be assumed they are too busy doing deals with profit-making service companies to write a book.